The “Ask an #SMXpert” series continues the question-and-answer (Q&A) segment held during sessions at Search Marketing Expo (SMX) West 2018. Today’s Q&A is from the Advanced Audience Targeting & Management Tactics session with Jillian Nagle and Ben Wood and introduction from moderator Brad Geddes. The rise of audience targeting is the biggest change in paid search over the last 10 years. 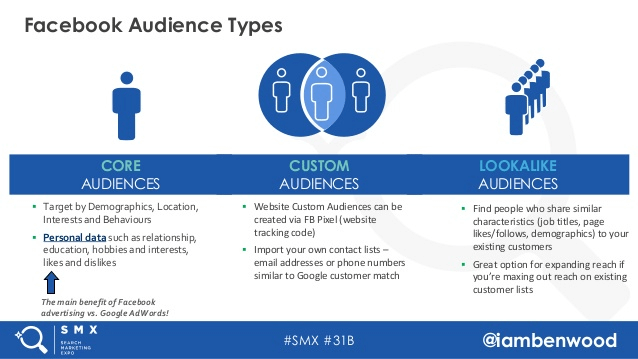 You can easily create audiences based on a plethora of characteristics and then adjust bids, ads and content for each audience type. With so many options possible for creating audiences and customizing your marketing for each, it’s imperative in today’s competitive world that you have solid strategies in place to take advantage of these marketing capabilities. In this session, we looked at creative ways to create audiences, how to prevent your customers from going to the competition and ways of leveraging search and social together to ensure you are reaching your potential. Ben Wood took us through remarketing lists for search ads (RLSA) and Facebook audience tips to then set the stage for combining AdWords and Facebook audiences together to leverage audiences across the networks. Jill Nagle thinks there are times when myths about audience targeting prevent companies from using the correct tactics throughout the funnel. She showed some common myths about audience targeting and then debunked them with their own studies on how to ensure you are using the features correctly throughout the user’s lifecycle. Question: If using RLSA for competitors, how do you maintain Quality Scores when your competitors’ names are also branded or trademarked and you cannot use them in ads? Question: Have you run into any clients that have expressed concern over message saturation due to the fact that cookie-based, customer relationship management (CRM) and other audiences can and often will overlap? Jillian: This is where audience negation and custom combination lists are so important! 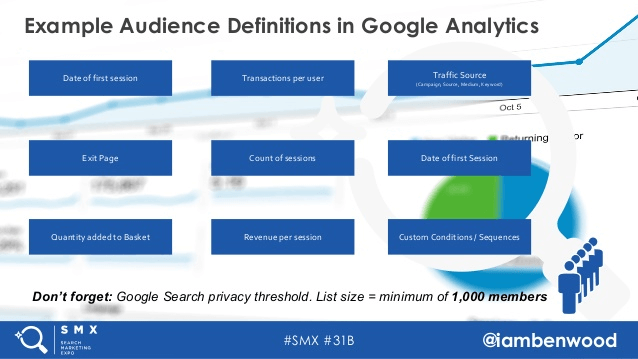 I always say that we need to evaluate audiences like we would evaluate keywords. We use keyword negatives to ensure the proper keyword mapping; you need to use audience negatives to ensure proper audience structure. A sound structure can be achieved by making custom combination lists that negate the wider audiences from your more niche ones. For example, if you have messaging you want to deliver to those who have purchased in the past, previous purchasers need to be negated from all other audiences. That way, they’re not getting messaging or treatment that is better for someone less familiar with your brand. Question: Do you have any tips for working with audiences for low-traffic sites/accounts? First, with your own data, start very high level! Maybe you only have a return visitor strategy, maybe you only have an existing customer strategy. That’s fine! Segmentation needs to be meaningful, so only set out a strategy that fits your scale. Second, with small accounts, there is often not enough scale to make use of RLSA lists. In this case, I recommend exploring Google data, such as demographics and in-market audiences, to identify valuables audiences before they even visit your site. And last, some of your biggest wins will come from expanding volume via audiences! 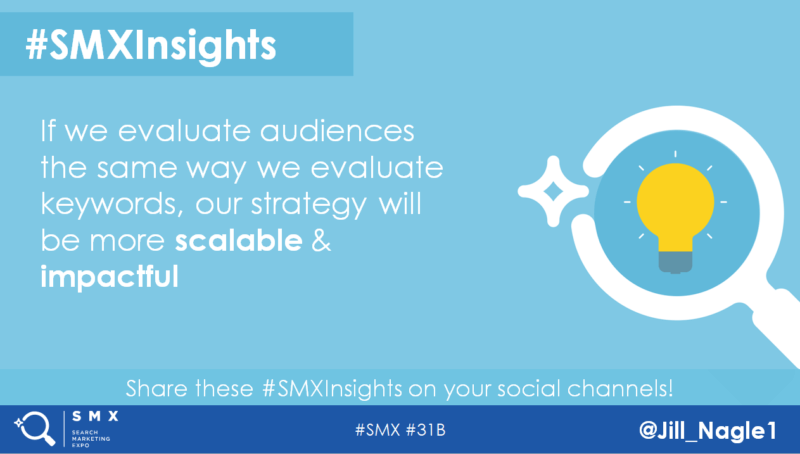 If you have a valuable audience, scale the account by playing on larger, more competitive terms on more select audiences. For example, while I was working on a small business banking account, I also ran into issues with scale. Rather than only playing on business non-brand terms, we expanded to consumer terms like “open bank account” by only targeting audiences or ZIPs that we knew had a higher propensity to capture business owners. This allowed us to play in a competitive, high-volume space with low cost per action (CPA). 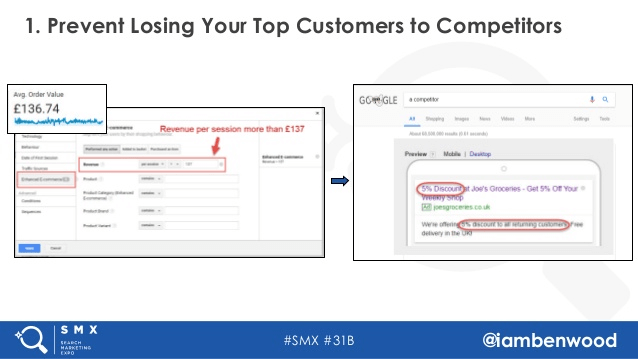 Ben: Quality Scores will never be great when bidding on exact match competitor brand terms, however, if you combine competitor brands with related keywords and include related keywords in your ad, there’s a way to boost quality score and reduce cost per click (CPC). Most of our clients increase bids more for competitor + related term combinations rather than just competitor brand names. Question: Does Facebook include in audience targeting the job titles, for example, of people who have selected the “only me” privacy setting? Ben: This information isn’t visible to the general public but can still be used by advertisers, as it’s anonymized. 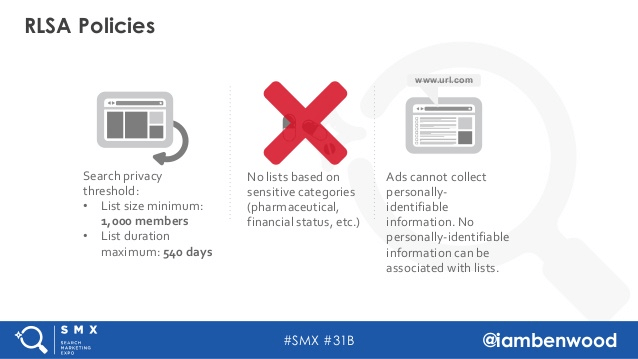 Individuals can, however, prevent themselves from seeing these ads by amending their advertising settings. Question: What are the differences with Facebook Lookalike Audiences versus Google’s similar audiences? Ben: Facebook Lookalike Audiences are essentially the same principle as Google similar audience in [that] they’re an expanded set of users based on shared characteristics of an existing audience. The key differences between Google similar audiences and Facebook Lookalikes are the detail each network [has] on their user base. We have seen better results using Facebook lookalike audiences, presumably due to the amount of detailed demographic and interest data Facebook has on their users versus what Google has. Ben: Start with broader audience retargeting methods such as previous site/page visitors and build from there. A lot of the more advanced methods explained in the session rely on having a high-traffic site. Question: What tools do you use to update audience modifiers once you see the performance? Do you do this in AdWords, or are there other tools to map out where you should modify? Ben: We label all campaigns using bid modifiers and filter and order columns in AdWords based on performance. If a bid modifier is working well, we often ramp it up for a couple of weeks to see if we can further improve, and vice versa. This is a manual process for us at the moment. Question: How is this audience-building through cookies going to be affected by the General Data Protection Regulation (GDPR)? Ben: Google and Facebook have already been the subject of lawsuits from Austrian privacy activist Max Schrems. Both have updated their policies and have asked users to agree to their new terms and conditions over the past few months. I’d be surprised if the lawsuit was successful, but one thing I would encourage advertisers to be wary of is the use of Google customer match and Facebook custom audiences if they don’t have a record of how they obtained the customer data in the first place, as this would be in breach of GDPR regulations.